Try making your own soap bars or bubble bath using pure castile soap. Learn some DIY bath additive recipes on our blog, The Well! My go-to for laundry detergent. Iâ€™ve been using this detergent for my kidsâ€™ clothes for years â€” highly recommended! This soap is perfect for making your own face wash, body wash, bubble bath, hand soap, etc. I mix in vegetable glycerin so that it doesnâ€™t dry my skin out, however the unscented baby Dr.Bronners has twice the olive oil in it than the other scents. Love this! So nice and gentle! 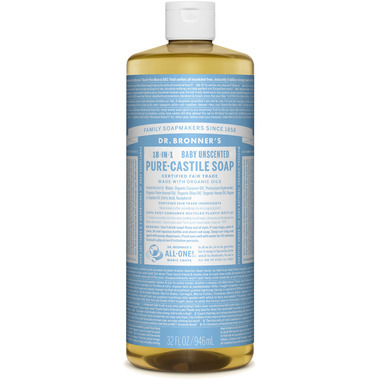 Best castile soap out there! I love Dr. Bronner's Pure-Castile Soap, Baby Unscented - I use it to clean my 'abeego' beeswax food wrap. I don't worry about using this soap on a product that I wrap around my fresh produce. Only unscented, not fragrance-free, but at least the smell isint lab-made artificial fragrance. I dilute this with water and put it in a foaming hand soap dispenser. It goes a long way!! This soap is WONDERFUL! Because it has no scent, I put in a few drops of orange and lemon essential oils to perk it up a bit. I use it in a liquid soap dispenser and there's never been an issue with clogging. Sometimes, I add a few drops of glycerin, which makes it go a little farther and also ups the moisture content. This soap produces a nice amount of "suds", so you feel as if your hands are truly getting clean. It's effective and non-toxic and it's definitely not just for babies...! Love making foaming soap with Dr. Bronnerâ€™s. I use this liquid soap in many of my DIY home and beauty recipes. Use this product on my baby and everything he plays with. Even make my own baby wipes with it. A good, clean product parents can feel comfortable using on their babyâ€™s skin. Very well reviewed on ewg.org! I use this product for EVERYTHING... making my own soap, baby wipes, not to mention it being safe for the environment when we are outside camping! We love it! This soap is a go-to in our household. We've repurchased multiple times! The unscented version is my favourite. You cant find a cleaner soap on the market. Love this product! Bottle lasts forever. I use it diluted as hand soap in a pump. I have also used it for laundry on mildly soiled items like pillow cases. I keep coming back for it. Very easy on the skin, no adverse affects, no scent and no residue. Give it a try! Recommended by the tattoo shop and have never stopped using it. It doesn't irritate sensitive skin or bother eczema. This product is wonderful. My hands are no longer dry after using this product. I don't have to use the moisturize lotion after washing my hands. I choose plain because as previous reviewer I would like to add my own essential oils. This is the product I will use from now on. Great product ... so versatile. Love the unscented so I can add my own essential oils when I make my own products. Love this product. Don't need a lot to make a big effect. I use it on my little girl, she was born a micro preemie so I want to avoid using as many chemicals as possible. So far, she love bath time. I love that the soap leaves her with her own baby smell,rather then those artificial baby smells. I absolutely love this brand, is the only cleaning product i have in my home except baking soda and vinegar. Is perfect for cleaning everything and is non toxic, I use it as a shower gel, facial soap, hand soap, baby soap, dish washer, light scrub (baking soda and few drops of soap). I recommend this to everyone. Love this versatile product! Love that this one is scent free. Buy it and make my own body wash , hand soap, dish detergent, and washing machine detergent. I love this product! Cleans well and is healthy. I donâ€™t miss real soap at all! I will keep buying this soap forever! Fantastic product with a myriad of uses! Shampoo, body and hand wash, even as a tub cleaner and more! A little goes a long way and we've found it to be perfect for ultra sensitive skin. Highly recommended! Great product, super versatile. I just wish the bigger format was available on this website. Excellent soap product, have been purchasing it for years now and find it covers all our needs with the added bonus of being chemical free and so gentle on the skin. Return Dr Bronners customer here. So many uses, and very long lasting. Love it! I use it to make my own makeup remover wipes, facial cleanser and hand soap. Nice and natural! I keep repurchasing it! Love this product! I use it in all my homemade body and face washes. Great product and great price. A little goes a long way. Very gentle for sensitive skin and no chemicals. Highly recommended! Love this soap! Use it as a base in many DIY natural products for my family and home! Love this soap. Can be used for so many things. Have used this on my baby since she was a newborn and is so gentle on her skin. Highly recommend. I love this soap. I have a baby, and I don't worry about cleaning products because I clean everything with this. I even use it to make my own shampoo. No harsh chemicals! Excellent base for my homemade foaming hand soap. I LOVE this soap!!! I mix it half & half with water & add essential oils in my foaming hand soap containers. I like adding my own scents, knowing there's not a bunch of artificial junk & fillers in what we use on our bodies. I make my own soap with this. I like that it has no scent and I can add my own. Works well. A plus for this product. I use it to make dish soap and cleaning products. It is amazing! Purchased this liquid soap because I needed it for a salt scrub recipe. Worked out great! Cleans well, fragrance free and gentle on my skin. I can add an essential oil for fragrance if I want to! Will definitely buy more. (Through some combination of air humidity, diet, and everything else) this soap has been helping keep the eczema on my knuckles in check. I haven't switched to other brands ever since I've used this for the first time. This soap has all the features I like: organic, safe, effective, fair trade. This is the only liquid soap I buy. Excellent product. A little goes a long way. Always use it to make my essential oil foaming hand soap. This product is amazing & I will keep ordering from Well.ca! The difference in my skin & hair since using Bronner is awesome! Love the feel & I couldnâ€™t be happier!